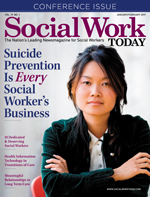 Each year Social Work Today asks its readers to nominate their colleagues to be recognized for outstanding service in social work by sharing their inspiring stories. Year after year we're amazed by the extraordinary impact social workers are having across the country. To recognize some of these efforts, we have chosen 10 finalists whose stories we are honored to share. With the receipt of so many wonderful stories, choosing only 10 is a challenge, but we've read all of your essays and have selected our 2019 finalists. We invite you to read their stories below. A child's cry for help led Cheryl Aguilar on a path to social work as a second career. She had already been working in the fields of journalism and public relations for a decade when she was hired to raise awareness for the mental health needs of immigrants. She admits she knew nothing about mental health, but she had done previous work with the Latin American Youth Center and the center believed her communication skills would make her a perfect fit. As Aguilar began working with youths, helping teach them skills to advocate for their needs, she found that many of the kids started sharing their stories with her. But she will never forget the child that expressed suicidal thoughts to her—because it changed the whole future of her career path. "I felt frozen," Aguilar remembers. "I said, 'Let me walk you over to a counselor.' But the child said, 'No, I want to talk to you.' I knew I wasn't equipped. I wanted to help, but I didn't know the right things to say. That's what ultimately inspired me to pursue social work." Aguilar says that she was afraid to go back to school and "start over" when she had already developed a career. But she also knew it was where her heart was leading her. Wanting to focus on mental health and counseling, Aguilar opened a private practice and has been particularly focused on responding to the mental health needs of immigrants. Aguilar herself is an immigrant, having come to America from Honduras as a child, and says that the current political climate has inspired her to do more advocacy work. In fact, Aguilar has spearheaded the formation of Social Workers United for Immigration, a group of social workers that meets monthly to determine the best ways to impact clients. "I realized whenever I went to immigration rallies or events that there had to be other social workers there; I just didn't know how to find them," Aguilar says. "Coming together allows us to be more of a collective voice and to work together for change." Serving as a medic in the US Army and becoming medically retired in 2014 left Bryan Asher with the difficult decision about what to do next. Despite no longer being on active duty, Asher says the desire to help his fellow soldiers remained. That answer came in working for the VA. Asher completed his graduate studies at Syracuse University and found that his second-year internship with the VA led to full-time employment. To date, his career has been in the field of chemical dependency and he has been closely involved in the treatment of opioid dependence. In fact, Asher helped spearhead the advancement of the VA's medication-assisted treatment (MAT) program. "Through training, education, and engagement, we successfully bridged the gaps between several clinics outside of substance treatment, providing our veterans with greater access points to MAT options," Asher says. Aside from helping to develop and expand the MAT program, Asher says his greatest accomplishments in social work have been the engagement with veterans across various branches of service. "It has been an unparalleled experience," he says. "While I no longer am able to wear the uniform, being able to care for my fellow veterans fills me with a sense of pride and continued service to my country." Knowing she wanted to work in mental health, Jackie Boenisch assumed she would need to become a psychologist—but she ultimately learned it wasn't the right path for her. Instead, a professor suggested she pursue a master's in social work. "At that point, all I knew of social work was child protective services," Boenisch admits. "I didn't realize how diverse the field was and I certainly didn't realize that social workers were among the largest providers of mental health." Upon the professor's advice, Boenisch enrolled in an MSW program at Columbia University and during her first-year placement was confident she was on the right path. During her second-year placement at a psychiatric hospital in Manhattan she knew she wasn't just on the right path—she'd found her true calling. While there, she learned about the Pathway Home, which provides intensive case management services to adults with severe mental illness transitioning from one setting to another. Upon earning her MSW, Boenisch sent them her résumé and, as she says, "The rest is history." At Pathway Home, Boenisch has worked with individuals who have the stigma of being "too severe to treat." That's included many individuals coming from the criminal justice system—often those who have been in prison for a long time and are then transferred to a psychiatric hospital. "We work with people who have been convicted of manslaughter, arson, even murder—who did something 30 or more years ago, but it follows them to this day even when they want to change," Boenisch says. "Many people have said no to them. But how do I say no? These are people who really need support—and I want to be able to provide it. If someone has received support they are less likely to get readmitted, more likely to engage in treatment, and more likely to become a productive member of society. That's why I say yes." As a youth, Cherish Fields spent many turbulent years moving around in foster care and lacking the support of family that so many people take for granted. But Fields' story is one of victory—as she often tells the foster youths she works with today. She tells them, "Your story can be about overcoming and about success." For Fields, that meant graduating from the University of Michigan with degrees in sociology and social work. Her first job out of school was working with youths in the juvenile justice system as a therapist in a day treatment program. Today, Fields is a social worker at the House of Providence, a Detroit agency that provides housing, therapeutic programming, and educational support to children who are wards of the state. The first social worker within the organization, she was responsible for building the program. Being able to relate to foster youths obviously has a personal connection to Fields, who actually took guardianship of a young woman while simultaneously completing her grad years. "She wasn't going to graduate high school but lived with me and ultimately graduated with honors and went off to college," Fields says. "She is now working with homeless youths." More recently, Fields took in two teens at the same time—hoping they could support one another. While one of the young women went off to college, the other was later tragically killed, which was a lot for Fields to grapple with. Even so, she forged on and even took in another child after that. Upon getting pregnant, she closed her foster care license but says she doesn't know what the future will hold. "Being able to be a support—even a momlike figure—to kids who don't have any support is inspiring to me," Fields says. "I know what it's like not to have that." Growing up in the rural Midwest, Jeanine Jones had no idea of the concept of "social worker." But she grew up with a mother and a live-in grandmother who helped serve the impoverished within their community. Jones says she was "surrounded by social work without even knowing it." In her 40 years of social work, Jones has worked in direct practice, corrections, hospice work, and more, with the goal of exploring all areas of the field. But it was her work in child welfare—right out of school—that inspired her personal life the most. "Though I was on a personal track of thinking I wanted to become a biological parent, I started to look at all of these kids I worked with and thought, 'Why bring more kids into the world when there are so many that need homes—particularly those with special needs or who are older?'" Jones says. "Since that time, I have been the adoptive parent to six special needs children, who formed our interracial family. I am currently also parenting a grandchild. My social work ethics and values are integrated into my personal values." Those six special needs children are all young adults now and "living their own life," Jones says, but they still "come back to visit regularly." In addition to currently raising her grandchild, Jones is kept busy with her foster work for the Humane Society—something else that she has always been passionate about. Over the years she has had rescue donkeys, chickens, Nigerian dwarf goats, cats, and dogs. Currently she is fostering three little Chihuahua puppies. Professionally, Jones is in her 21st year of teaching (her eighth at Western New Mexico University). She believes the intertwining of her social work values and her personal values provide opportunities to teach students "things that can't be found in books." "Even after 40 years I'm still so incredibly passionate about the field of social work," Jones says. "I look in the mirror and I see gray hair, but I still have no plans of stopping any time soon." As a mental health clinician for a project that offers evidence-based trauma-informed services to children and families in the pediatric primary care clinic at the Medical University of South Carolina, Carla Newman provides both assessment and treatment services. She also works within the community (in both homes and schools) to meet the needs of traditionally underserved populations who face significant obstacles to receiving traditional clinic-based services. Since so much of her caseload is focused on children in the foster care system, Newman spends a lot of time stepping up to be their voice, noting that the role includes a tremendous amount of "problem solving." "I'm often faced with the question, 'Instead of moving this child again, what can we do to fix this problem?'" Newman says. "I'm always looking to determine how we can set up the child and the foster parent for success. Or, how can we set up this biological parent for success. My passion for this work is driven by their needs and I've seen how it can pay off when we can get everyone on the same page." Sometimes that also means working with the school. If a child is getting into a lot of trouble or kicked out of school frequently, Newman is there trying to figure out "what can we do?" She says it's "all about working together for the success of each child." Growing up, Newman was influenced by her grandmother—after whom she's named—a teacher who started her own alternative school to help the underserved population in her town. "She received a master's in counseling and started a private practice to be able to advocate for kids and their families," Newman says. "I always knew I wanted to do something like that and ultimately discovered that social work was the answer. Though it's tough work, there's nothing like the feeling when you are able to play a role in helping make a seemingly hopeless situation work out." Having seen mental illness affect her family life, Glendalee Olivera has always known she wanted to be in the field of social services. While she thought that would mean a career as a psychiatrist, she was turned off by the "impersonal nature of it" and the "lack of connection the practitioner appeared to have in patients' lives." Instead, she pursued social work and hasn't looked back. Working at the Weinberg Center for Elder Justice, an emergency shelter for older adults who experience abuse in the community, Olivera loves working with a population who she believes is vastly underserved. She has always held a special reverence for older adults. "I had the honor of being raised by my great-grandmother until I was 16 and she passed away," Olivera recalls. "The wisdom and presence of older adults has always played a special role in my life. Unfortunately, I have also had the experience of domestic violence impact my own life, and lead to the loss of a family member, so that is also an issue close to my heart." In her five years at Weinberg, Olivera has gone above and beyond. When the sister (and only family) of a client with dementia passed away, Olivera found the client was experiencing the grieving process over and over again. In order to help provide some closure, Olivera discovered that the sister's ashes had never been picked up. After retrieving the ashes, she presented them, as well as a homemade memorial card, to the client, who now carries the card as a reminder. "I've found that the most important thing I can do is to give some sense of control back to clients," Olivera says. "Sometimes that can mean small gestures and other times they can be big but either way, I find if it makes a difference in their lives, then it matters." Emily Reyes has always known she wanted to work with kids. While her earliest jobs of coaching and babysitting helped her realize this passion, she wasn't entirely sure what career path was best suited for her. Though she started out with a psychology degree, she felt that included more testing than direct clinical work. Ultimately, that desire for a hands-on career led her to social work. "I have now been a school social worker for 21 years and it has felt like the best fit ever," Reyes says. "Even on the roughest days I have zero regrets. I feel that this role was a calling." Within the district, Reyes has several roles. She is the official mentor to new social workers, who must have 20 hours of contact time annually. As the social work department lead, she also directs monthly meetings and finds time to supervise a team of social workers working toward their LCSW. And, of course, she works with students—which is a highlight. "Being able to see mini breakthroughs with really challenging cases is so inspiring," Reyes says. "I just love working in a middle school with an age group that can make me laugh or inspire me on a daily basis. And as I've gotten older, my ability to connect better to the parents has led to an even greater job satisfaction. When we all work together, there's real power to make a difference and nothing is more exciting than that." When she was in private practice, Laura Wagner appreciated one-on-one time. But she also struggled with feeling that she wasn't "putting values into action." So, in her spare time, she was a volunteer organizer for UU Mass Action, a Unitarian Universalist nonprofit social justice organization that mobilizes to confront oppression. That work ultimately led to Wagner taking over executive leadership in 2014. For several years, she worked part-time as the executive director while running her private practice. But in 2017, she closed her private practice to focus full-time on her role at UU Mass Action. "I realized that I really wanted to work on systemic change in order to affect more people," Wagner says. "I'm very passionate about the work we do. As a faith movement, we are committed to dismantling white supremacy culture." Wagner has been a major player in organizing on behalf of many public issues in Massachusetts, including immigration rights and protections, climate action and justice, economic justice, and ending mass incarceration. As the granddaughter of Armenian genocide survivors, Wagner's fight for immigrant rights is particularly close to her heart. "My grandparents were just children when their families were slaughtered and yet they managed to come to this country and build a life," she says. "In today's climate, they wouldn't have made it. But we are doing work to get people out of detention centers and to help connect them with legal services. We are accompanying immigrants to court. Some days it's hard not to cry—it's all very painful. Yet, that feeling after having fundraised to help pay someone's bond and seeing them walk out and thank you is indescribable. It's amazing. It's a change in just one family's life, but it matters, and it pushes us forward." Following undergraduate school, Michele Whang went to work as a child protective services worker with the LA County department of children and family services. During this time, Whang encountered many hospital social workers, which opened her eyes to another area of social work where she could work with underserved populations. Sixteen years ago, she made the transition to hospital social work, a decision that's lead to a fulfilling career. Recently, Whang was reassigned to cover specialty care clinics, including hematology, neurology, cardiology, neurosurgery, and pulmonary services. The patients she works with are newly diagnosed with chronic medical conditions or being discharged from inpatient admission. Whang takes a "whatever it takes" approach to helping her patients and maintains what she calls an "open door/call-me-anytime" policy. Since the San Bernardino Regional Center shooting in December 2015, Whang has spearheaded an effort to bolster the safety of her colleagues. Upon the thought occurring to her that the hospital was vulnerable to potential attackers, she acted. "I first made arrangements for our staff to receive training from the LA County sheriff department on how to respond to an active shooter situation," Whang says. "The deputies also toured our office to make suggestions for the best escape routes, where to hide, and what improvements we could make. The installation of panic boxes and loud speakers were identified as necessary improvements." Whang fought for those additions, taking the same "whatever it takes" approach she takes with patients. Even at home, Whang maintains the same attitude. With a heart for animals, she has a passion for rescuing guinea pigs that were kept either by hoarders or by people unable to provide proper care. She takes them in and places them in loving homes. Clearly, in work and in life, Whang is always looking for ways to help.